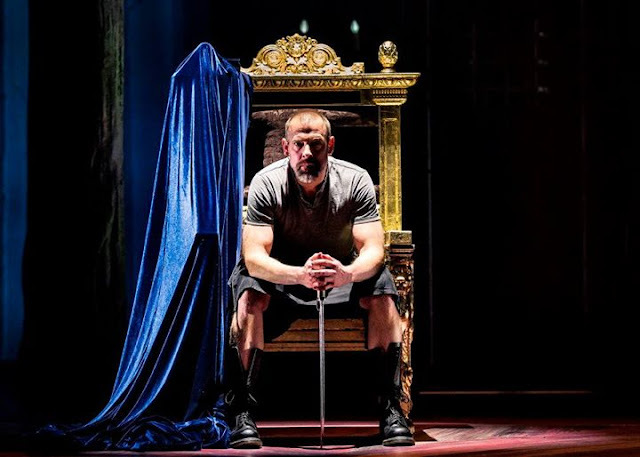 DADaPalooza: Macbeth is Magic at the Chicago Shakespeare Theater! 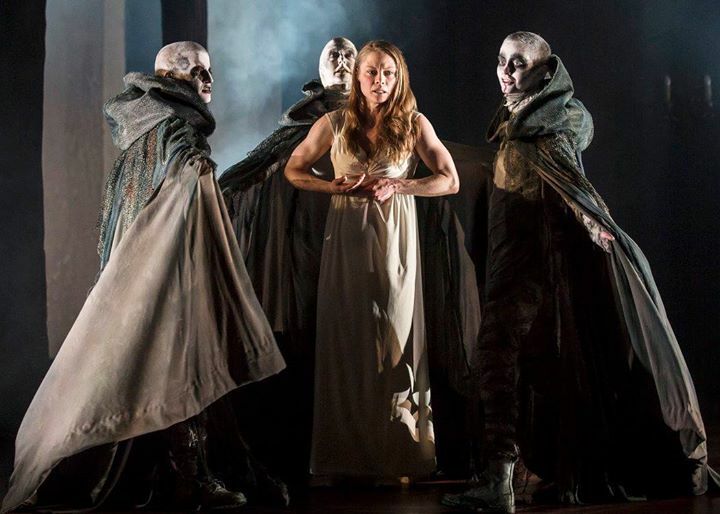 Macbeth is Magic at the Chicago Shakespeare Theater! I took my 9 and half-year-old son last weekend to see MacBeth at the Chicago Shakespeare Theatre. The play is getting a lot of ballyhoo (and rightly so) It is running at Navy Pier through June 24. Directed by Aaron Posner and Teller (of Penn and Teller) the show features a fair amount of spooky and macabre magic, as well as some beautifully staged Shakespeare. READ AN INTERVIEW WITH THE DIRECTORS OF THE SHOW. (Theo Germaine, McKinley Carter, and Emily Ann Nichelson). Photo by Liz Lauren. My son was super excited about the show, primarily because it was being directed by Teller, and he loves magic. I also mentioned there'd be swordfights. I think I may have oversold it to him, however, and I think he expected to see a magic show that may have had some acting in it rather than a pretty brilliant play that happens to have some very good magic in it. And there were swordfights, but it wasn't like the whole play was one giant swordfight. I'd prepared him by telling him the story, which is relatively complicated (explaining the "no man born by woman" was also a little difficult) but what was true was I hadn't prepared him for the macabre witches who dominate the show and seem to appear everywhere. If it were a Greek play, they'd be the Chorus. They are still a chorus because they do sing throughout the show, accenting some of the scarier parts. (There's also an excellent percussionist, who plays a lot of sound effects in full view of the audience) He thought the witches were "Creepy" I will give it to him, they really are. (Ian Merrill Peakes) with a prophecy of epic proportions. Photo by Liz Lauren. I hadn't prepared him for some of the brutality in the show. 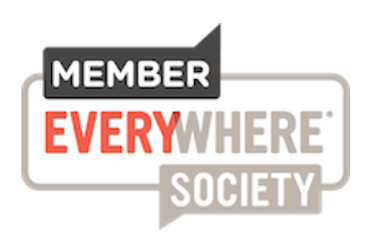 There's a fair amount of gore, and death, and just cruelty. I wasn't quite prepared myself. I knew it was coming because I know the play pretty well, but I'd forgotten the extent of it. When the murderers come and kill MacDuff's family, it happens right on stage, and as the child's neck gets cracked, it's a chilling moment- I held his hand and winced. 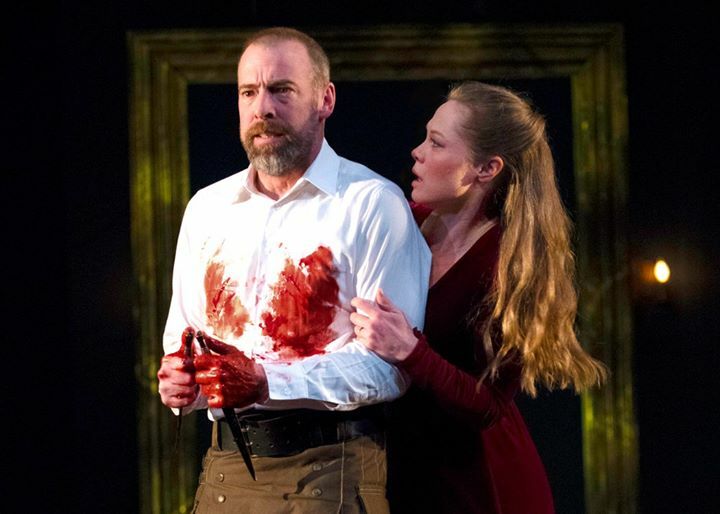 Lady Macbeth (Chaon Cross) commands her husband (Ian Merrill Peakes) to return the daggers to the scene of their crime. Photo by Michael Brosilow. This play has a lot of classic lines (Is This a Dagger I see before me? Out OUt Damned Spot, A Tale told by a Madman, full of sound and fury, signifying nothing.) The language is wonderful, and although a little hard for a 9 year old to parse, he did a great job at sticking with it. 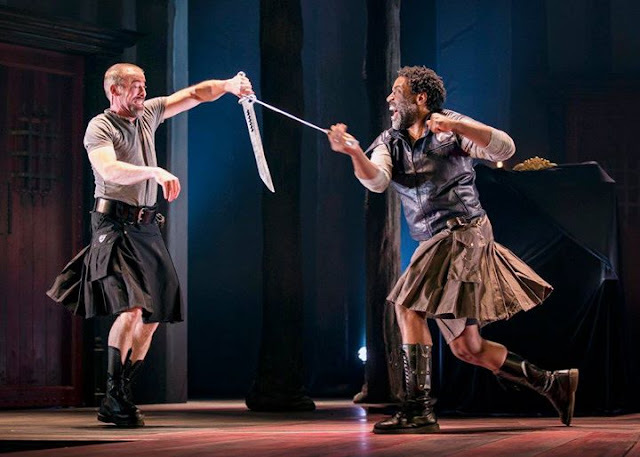 Macbeth (Ian Merrill Peakes) and Macduff (Timothy D. Stickney) fight to the death. Photo by Liz Lauren. 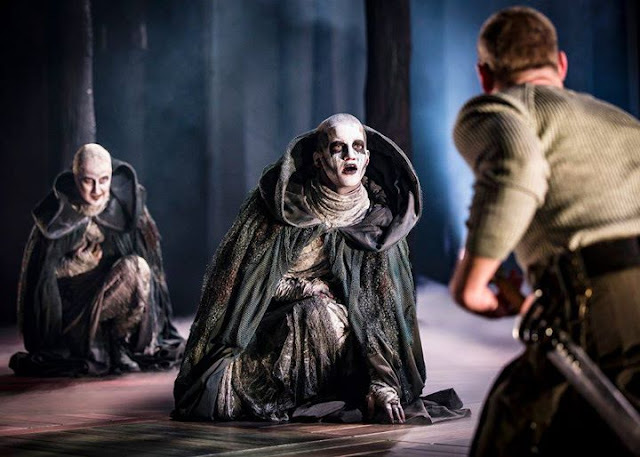 Macbeth (Ian Merrill Peakes) weighs the consequences of the path he has taken in MACBETH, adapted and directed by Aaron Posner and Teller, in The Yard at Chicago Shakespeare Theater, playing now through June 24, 2018. Photo by Liz Lauren. I highly recommend seeing the production, and yes, bringing your kid. 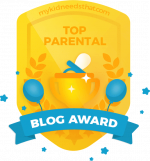 You will have plenty to talk about on the ride home! Tickets start at $40, although there are special prices for under age 35.